There is no greater anticipation, for a cricket fan anyway, than the start of a new season. There is a problem though, and that is with a crowded itinerary it’s hard to keep track of all the matches. Cricket has all fans covered with not only a list of all the international and first class fixtures but pen pics of all the players from each country. This must be particularly challenging for the magazine editor as they decide who to include from the home country. Listing the current Test stars is obvious but it must be tough as to which peripheral players to include. To show just how difficult a task it is, Cricket has included 27 potential players and still bowler Joe Mennie managed to slip under the radar. Hindsight is always a wonderful thing. Apart from the Aussie players there are pen pics of the South African and Pakistan players too. Both countries will play three Tests each against the home nation. A section on past results and statistics on player achievements will keep all cricket geeks happy. As well as Pakistan and South Africa there will be an ODI series against New Zealand and three T20 matches with Sri Lanka, pen pics are included for both these countries too. With the glut of internationals, Cricket still manages to provide details of all the domestic matches including the ever growing Big Bash. Another plus of Cricket is the inclusion of an article on the leading female cricketers. After a successful debut the women’s Big Bash should continue to grow this season. While Cricket focuses on the 2016/17 summer there are some great articles. 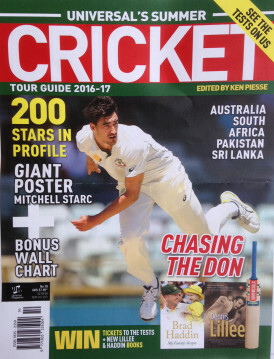 Topics such as day night Tests, and features on Pakistan leggie Yasir Shah and South African speedster Kagiso Rabada, are worth the cover price alone. For the cricket tragic there is a section on new cricket book releases and some extracts from upcoming books, a couple of which have been featured already on Cricket Web, including Ken Piesse’s A Pictorial History of Test Cricket. Just to finish off there is a cricket quiz. If you want to compare yourself to the Mac, you will need to improve on my 15/18. If you are going to immerse yourself in the Australian summer than this is a must have for season 2016/17, highly recommended.